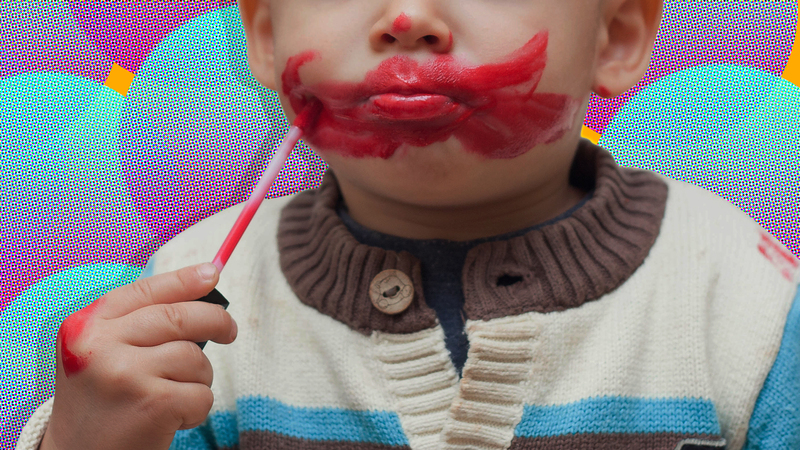 What’s the Right Age for Kids to Wear Makeup? Image: vesi_123/Getty Images. Design: Ashley Britton/SheKnows. My almost-8-year-old daughter has never mentioned makeup to me. She's seen me apply it; she's seen false lashes and an array of rainbow colors on her 16-year-old cousin's face, and she's seen several of her classmates turn up to the school disco with glossy lips and painted nails. I've always secretly been relieved that she's shown no interest in makeup, even when so many of her peers do. Not because I want her to stay a baby forever, but because I don't want her to try to grow up too quickly. But I'm preparing myself for the day when she comes downstairs with her cheeks smeared with whatever she's found in my makeup bag. Author Laurie Endicott Thomas, a medical researcher, editor and journalist, tells SheKnows that young girls "generally want to wear makeup for simple reasons… They want to bond with their friends by doing the same thing that their friends are doing… or they want to show that they are not babies anymore." Boys, on the other hand, generally have a very different reason for wearing makeup, says Endicott Thomas. "For boys, wearing makeup is generally a gesture of defiance against a society that is hostile to them. It can be a way of fitting in with a clique of misfits. Makeup and 'weird' clothes can even be an odd sort of protective coloration. If he wears makeup and unusual clothes, he can feel that he is being attacked because of something superficial rather than being rejected for who he is." Before you impose rules about makeup on your kids of any gender, consider the child's actual age as well as their emotional and developmental age, Carrie Krawiec, licensed marriage and family therapist, tells SheKnows. And don't worry about what is acceptable in other families, she says, as long as you set an expectation for what is appropriate in your own. "Because there are varieties of makeup, you may consider ranking them in order if how you see them from an age perspective, like perhaps lip gloss and blush may be seen as acceptable for younger kids, but eyeliner as [for] older [children]," says Krawiec. This is the approach taken by Lara, a mom of two from San Diego, California. "My daughter started wearing light makeup (lip gloss and mascara) in fourth grade," she tells SheKnows. "Initially, I thought she was too young, but when I realized most of her friends already wore makeup, I didn't want her to feel excluded. I do have rules about what sort of makeup she can and can't wear, though. I'm trying to teach her that 'less is more.'" More: What Is a "Safe" Sleepover, & When Is Your Kid Ready? Sasha, a mom of three from Chicago, Illinois, has a very different approach. "My daughters know my stance on makeup, which is none at all until they are 16," she tells SheKnows. "I know that might seem strict to other parents, but I want them to grow up with confidence in their natural beauty and not feel that they have to hide behind or change their appearance with makeup." If you do let younger kids wear makeup, you might want to have some rules about when it's acceptable and when it's not. The ability to wear makeup could be a treat your child earns for showing maturity and responsible behavior. "Identify and explain to your child that wearing makeup is a privilege," suggests Krawiec. "If there are things you would like your child to improve upon, such as cleaning their room or completing homework, consider using makeup as a privilege that can be earned. While there are no hard-and-fast rules, remember that if you are overly restrictive of your child's self-expression, they may rebel. Before you pick a fight with your child about makeup (or anything else), ask yourself a few simple questions: Will this affect my child's health? Will this affect my child's grades? Will this cause my child to hurt other people? "If you answer no to all three questions, that's a good indication that you probably shouldn't pick that fight," she says. Doing so can cause you to risk aligning yourself with people who might judge (or, especially with boys, even bully) your child over their decision to wear makeup. "So even if you 'win' the battle, you lose, because you have harmed your relationship with your child for no good reason," warns Endicott Thomas. More: My Mom Sent Me to a "Concentration Camp for Wayward Teens"
If you're concerned about negative responses from other people — particularly if your son is wearing makeup — Krawiec recommends having some standard responses up your sleeve, such as "This was a decision we made as a family based on our child's interests and our guidance as parents." Ultimately, you don't have to answer to other people. Being supportive of your child — with certain reasonable boundaries in place — is far more important than whether someone thinks your daughter or son is too young to wear a little lip gloss.